Through personal narratives and case studies, this fully updated second edition explores the childhood and adolescent experiences of transgendered persons. Addressing the differences between male-to-female (MTF) and female-to-male (FTM) individuals and identifying the specific challenges of transgender persons from diverse races, cultures, and religious backgrounds, this compelling book offers suggestions that will help social workers and the youths' families learn more about the reality of transgender persons' lives. Some of the areas discussed include: individual practice group work practice family-centered practice internal and external stress factors a new discussion of the legal issues that trans and gender variant youth facea new chapter on focusing on a recommendations for clinical treatment. Containing invaluable information on a topic that is not widely discussed or written about, the second edition of Social Work Practice with Transgender and Gender Variant Youth discredits negative stereotypes surrounding these youths and offers you insight into their experiences. 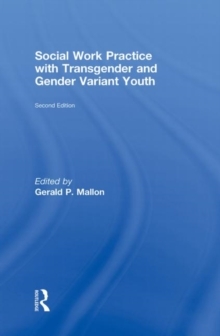 Additionally, the chapters openly address questions that practitioners may have about gender identity as well as offer concrete and practical recommendations about competent and positive practice with this population. It will interest academics and social service practitioners seeking to know more and work effectively with transgender and gender variant youth.